A new addition to the high-pressure platform! You are here: Accueil Actualités A new addition to the high-pressure platform! 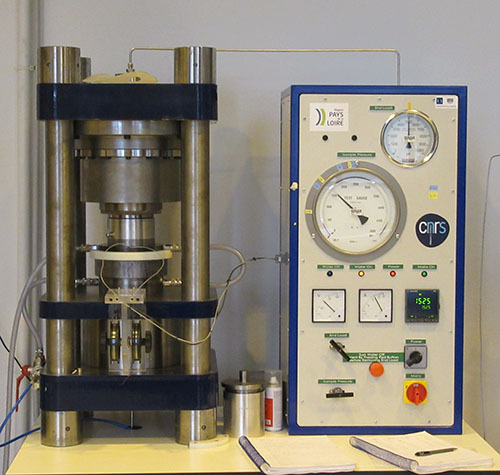 In 2017, the LPG boosted its high-pressure / high-temperature test platform through the acquisition of a new piston-cylinder device. High-pressure testing is unrivalled when it comes to studying the processes of planetary interiors. The LPG already has a national and international reputation in the field of high-pressure and low-temperature testing as a result of the work carried out by the laboratory on the icy moons of Saturn and Jupiter. With the capabilities to stress samples at high pressure and high temperature, this new technology will extend the LPG's field of scientific capabilities. “End-load” type equipment can be used to obtain pressure conditions between 0.5 and 3.5 GPa (>100 km deep on Earth) over a wide temperature range (T > 2000°C). Precise, automatic pressure checks are carried out throughout the experiment using a syringe pump (Stigma1000©), which is controlled by the computer during the experiment. While experiments are being carried out, samples are contained in a capsule made from a noble metal (Pt, AuPd, Au, etc.) ensuring closed system conditions. The sample is then placed in a solid assembly, with a continuous current injected into a resistive graphite furnace used for heating purposes. Quenching is then carried out at the end of the experiment, with quench speeds somewhere in the region of ~200°C/sec. A number of different scientific projects using this technology are currently in progress at the LPG, involving a range of collaborations. The LPG is divided into different themes, including the Earth, Terrestrial Planets and The Diversity of Icy Bodies. Based on these three themes, we develop experimental research aimed at understanding 1) magmatism rich in volatile components, 2) the historic magmatism on Mars (ANR MarsPrime) and 3) existing interactions between the silicate core of icy moons and the overlying liquid ocean (ANR OASIS). The versatility of the piston-cylinder technology means that it has been possible to develop research into scientific themes outside of Earth Science. The LPG recently launched a research project into the storage of volatile radioactive materials produced in the nuclear power industry. This project, CIPress, is carried out in collaboration with the IMN and Subatech. Indeed, the piston-cylinder equipment is designed to be used for a range of different research projects using pressure as an intensive parameter. > The platform’s chief scientist : Yann Morizet, Senior Lecturer at the University of Nantes, is an expert on the physicochemical properties of magma, the influence of volatile components on volcanism, high-pressure experiments and spectroscopy. > Funding: Manufactured by the Department of Earth Sciences at the University of Oxford (the United Kingdom) and funded by the Pays de la Loire Regional Authorities, the CNRS (The French National Centre for Scientific Research) and the University of Nantes as part of a scheme to enhance laboratory equipment.